This crazy thing below is our baby greens washer. It washes all of the greens that come out of our fields, from our baby salad greens to the spinach, arugula, and lollo rosa. I am pretty sure there is not another one like it in Arizona. When Bob and Marsha first went looking for something that could properly wash the greens, they wanted to find a washer that would gently and naturally wash the greens, while protecting the quality and freshness of the just harvested leaves. They looked at a number of much larger pieces of equipment, but Bob was worried that the mechanical contact with the delicate leaves of other washers would do too much damage to the greens. Bob is a little obsessive about the greens we grow and he wanted something that would be just as obsessive about how they were washed. What they eventually found was a company called Turatti, out of Italy, that had a machine Bob saw was that was about five times this size. It handled the greens gently, but cleaned them thoroughly without causing any damage or spoilage. The original machine was much more than what we needed, but when Bob talked with the company, he found that they made washers more suited to a farm our size. So much of the farming in Italy comes from small, family run farms that they understood what exactly what he was looking for and his desire to preserve the quality and freshness of the greens. The Turatti moves the greens through an icy bath of potable water (kept at 38-42 degrees) using air bubbles and gentle water jets, much like a spa would, to agitate the greens and clean and rinse them thoroughly. The bottom of the stainless steel tub is concave, so the greens are able to gently roll through the bath, while any sediment falls away to the bottom. Everything we use is NSF (National Sanitary Foundation) stainless steel, which is the best for food handling. 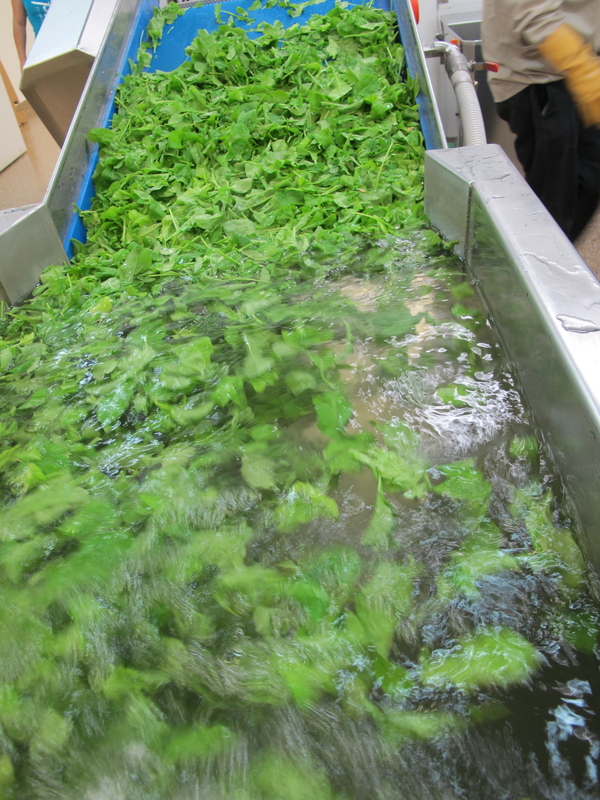 As the greens are moved to the end of the tub, there is a water fall that floats the leaves onto a nylon mesh conveyor belt. The greens are taken up the belt, with the water falling below along with any remaining sediment or dirt. The leaves are then dropped into a basket below, with cool air that blows off any that may stick to the belt. The baskets are then put into a large custom-made dryer that starts to spin them slowly and then picks up speed. 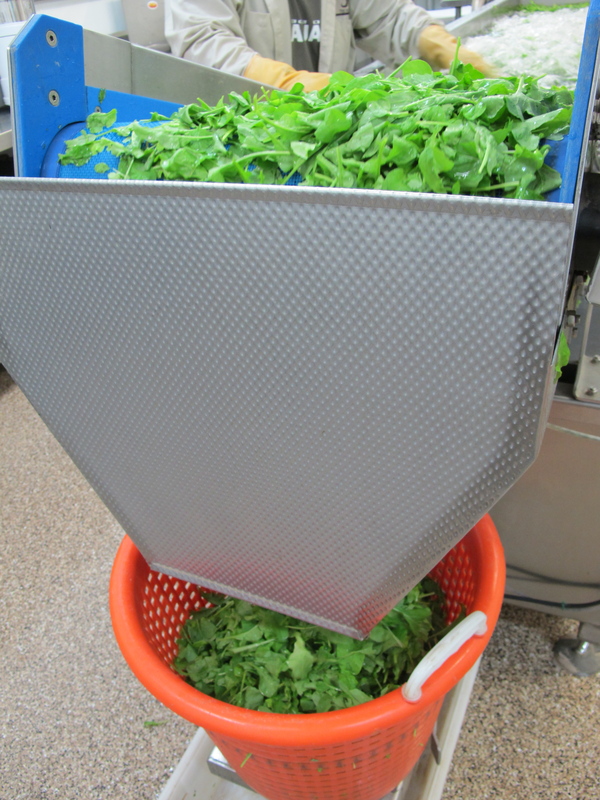 These baskets don’t hold as much as other types of greens dryers, and for good reason. Often times when washing greens, it is the process of drying the leaves that creates the most damage. 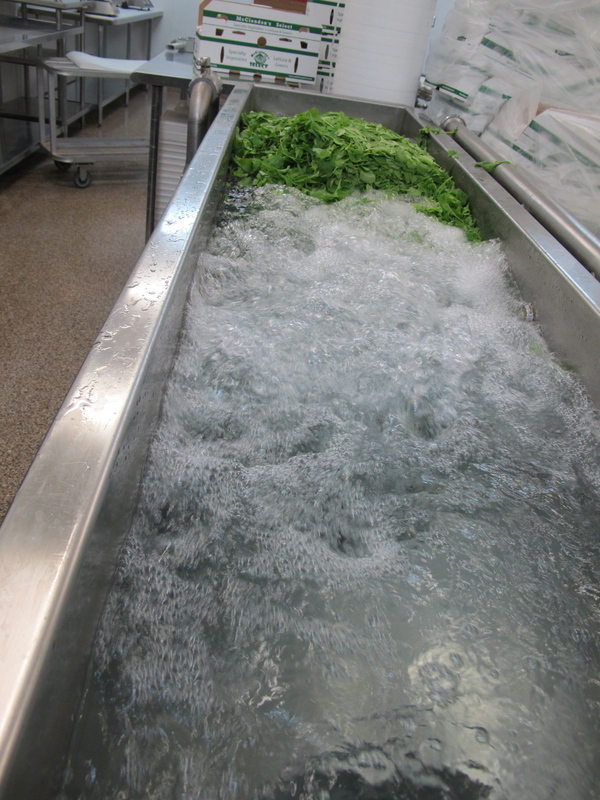 Most greens washers use baskets to dunk the greens in and out of water, allowing gravity to pull the water out. They are then spun at a high rate of speed to remove any remaining water. 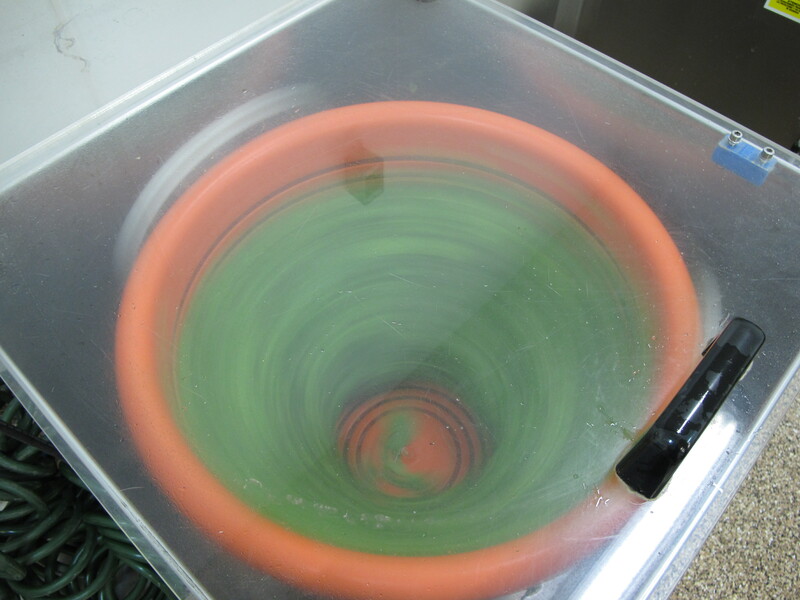 By allowing the greens to be exposed to air first on the convertor belt, and then spun slowly and increasing the speed gradually, the water is not weighing against the leaves and crushing them in the process. When gravity or centrifugal force is used too aggressively it can create abrasion against the leaves that will cause breakage and later spoilage. 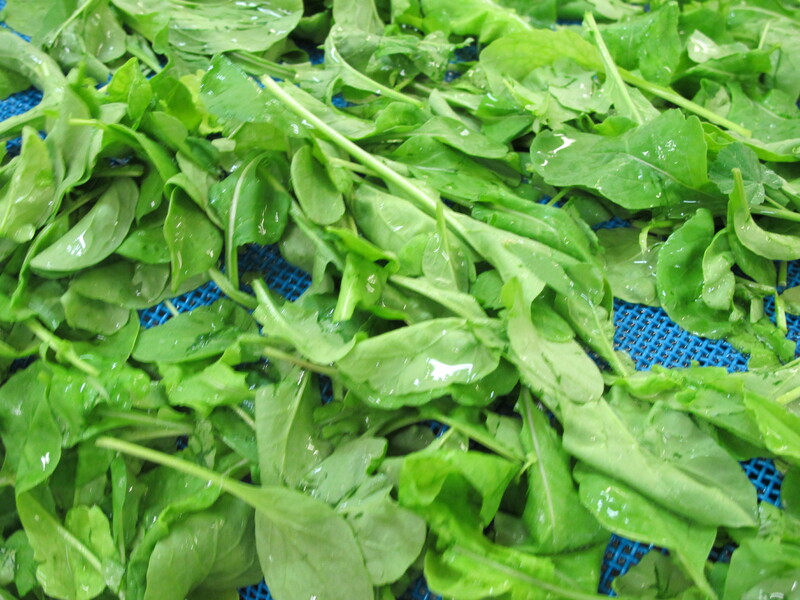 By doing this process gently and with smaller amounts of greens at a time, there is less weight on the leaves as they are drying, allowing them to be cleaned without damage. Whenever there is any kind of damage to a leaf it doesn’t just affect the spoilage of that leaf, but it can increase the rate of break down and spoilage for all of the greens. 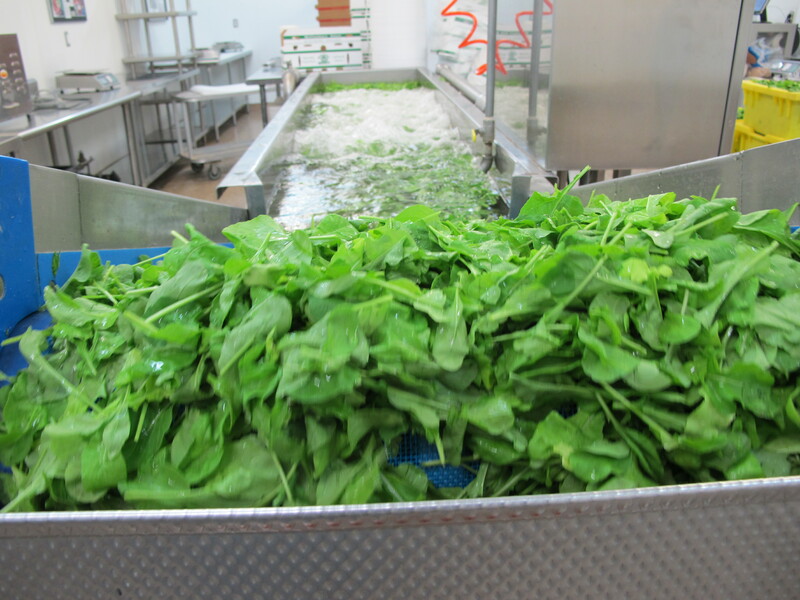 When we harvest any type of greens, they are immediately brought into a walk-in refrigerated box that is kept at 34-degrees. 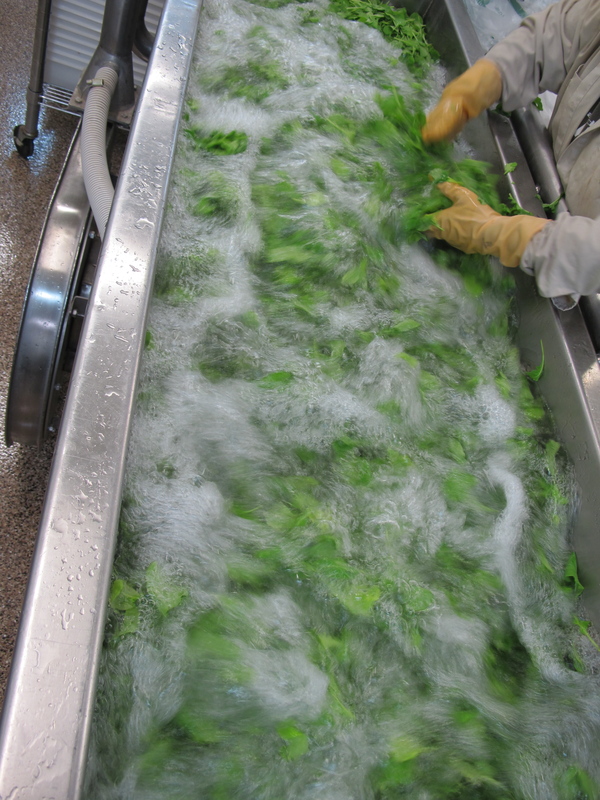 Once the greens have been chilled, we then have them washed in the 38-42 degree water. All of this is done in a clean room environment that is kept at 60-degrees. 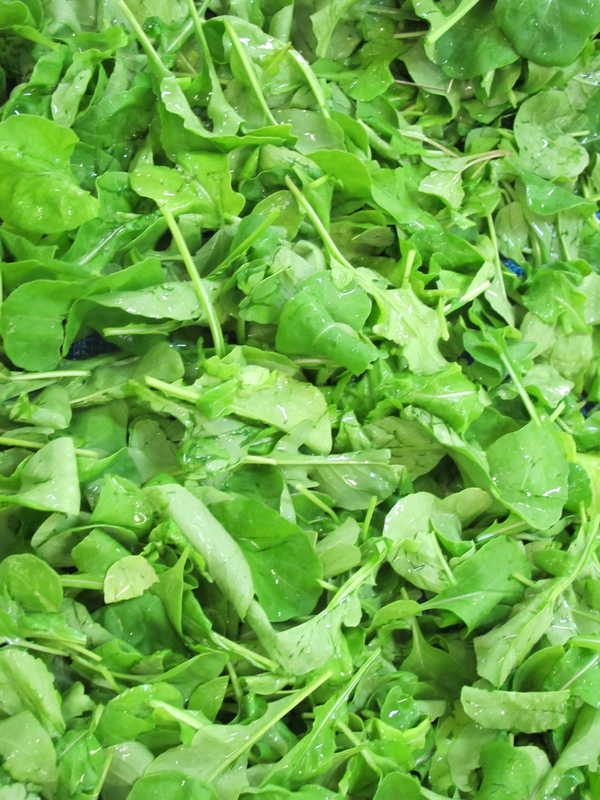 After the washing and drying, the greens are then boxed and put back into the walk-in box until the next day’s delivery to the farmers’ market or a restaurant. We keep the temperature controlled at every stage, to make sure that the greens stay fresh longer and so that they will taste their best when served. As with everything we sell, we advise our customers to keep all produce at its proper temperature when they return home, and to wash everything themselves before serving. We have a prior post on the care and storage of all of the organic produce we sell, that you can find here or using the link at the top of the blog. Leafy greens should always be kept as cold as possible in your refrigerator, preferably in an open bag. Closing the bag will suffocate them and cause them to start breaking down quicker. Allowing the bag to stay open keeps air flowing to the greens. As you can tell, Bob really does “baby” our greens. Thanks for the interesting post. Your greens are so beautiful and clean and now I have the back story! I am eager to see you at Town and Country next month! I am going crazy waiting until I can have your arugula. I won’t even eat that crap you can buy in the stores so we’ve been without all summer. I LOVE you guys and I don’t know what I would do without you. I feel like bowing to Bob every time I see him.